Buy Your 2019 Hong Kong Sevens Tickets Now! The tournament as always is expected to be a sell out. You can buy tickets through viagogo, the Official Ticket Marketplace for the Hong Kong Sevens now. The Hong Kong Rugby Sevens is the territory's premier sports event in the annual calendar. It was typically held on the last week of March but has now moved to April. The tournament runs from Friday to Sunday drawing crowds of local and overseas fans alike. More than the 24-team sports match, this has become a festival of sorts and just one huge wild party that goes beyond the Hong Kong Stadium, the official venue of the tournament. Party tents and big screens for viewing spring throughout Wanchai and Central during the tournament, with a host of other parties and entertainment, carnivals and parades prior, during and after the event. Where? 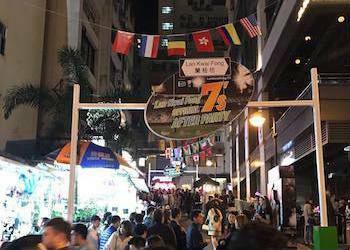 Tournament held at Hong Kong Stadium, plus outside giant screens and party tents at the Sevens Village right accross from Hong Kong Stadium and at Lee Gardens in Causeway Bay, more partying at Lan Kwai Fong, Soho and Wanchai. Tickets: For Hong Kong residents by public ticket ballot, registration begins in November. Here's more info on this year's ballot. For overseas travelers tickets are available through Viagogo, the official marketplace for the Hong Kong Sevens. How Much? HK$ 450+ Event sells out quickly!!! 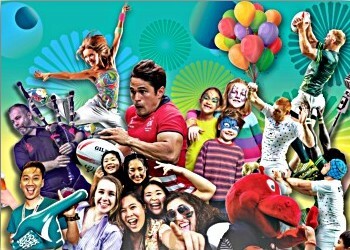 Find 2019 Hong Kong Sevens Tickets. The HKSEVENS Festival Concert will be the perfect warm-up for a weekend of world-class sport and entertainment at the Cathay Pacific/HSBC Hong Kong Sevens. 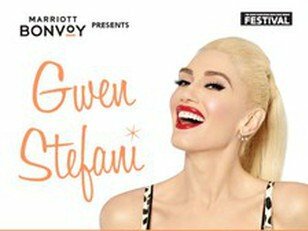 Three-time GRAMMY Award winner and global icon Gwen Stefani will headline the 2019 Cathay Pacific/HSBC Hong Kong Sevens Festival with a one-off show at the Central Harbourfront event space, presented by Marriott Bonvoy. The concert on Friday, April 5 will be the first time Stefani has performed in Hong Kong for more than a decade. More Info and Tickets: HK$780 The HKSevens Festival Concert. Running across the three days of this year's tournament, the Cathay Pacific/HSBC Hong Kong Sevens Festival extends the atmosphere of the rugby revelry and entertainment to the streets of Hong Kong. The 2019 edition will transform into "Sevens Central" for Saturday, April 6 and Sunday, April 7, a fanzone featuring live music, entertainers, the rugby action on big screen and free entry. This is the Hong Kong Rugby Union main Hong Kong Sevens Fan Zone which is more than Rugby action at this mega party. It features besides the huge TV screens where all games will be telecast live during the three days of the event, lots of food and drink options from around the world, DJs, street performances, autograph signing and after match parties. As in the past, Lee Garden One - the iconic high-end shopping centre on Hysan Avenue in Causeway Bay - will be reinvented as the Cathay Pacific/HSBC Hong Kong Sevens FanWalk, fans can share the famous Hong Kong Sevens atmosphere, right in the heart of Causeway Bay, conveniently en route to the Stadium. There are also many other activities that extend beyond the weekend of rugby action, a Wolfpack junior ninja warrior assault course, street performers and lots of family fun! 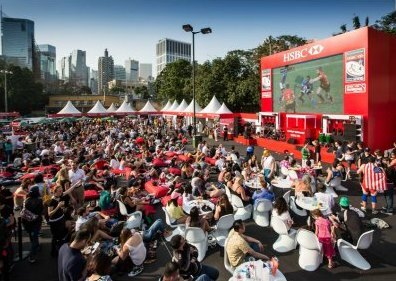 The HSBC Sponsored Sevens Village is situated right across from Hong Kong Stadium and those without a ticket will not only feel all the atmosphere from the Stadium but also have a close up of all the action, as every second of the rugby is broadcast on a giant Big Screen. The Village will be packed with fun for all the family. Friday from 11:00 am, Saturday from 8:00 am, Sunday from 8:30 am ...until the final whistle each day. How Much? FREE! The Village is open to the public for FREE all weekend and both ticket and non-ticket holders are welcome. Overlooking the HSBC Sevens Village is the luxury twin deck pavillion with large outdoor terrace and upper level balcony. VIP packages include 5-star buffet, open bar, private suites, etc. For the Kids, in anticipation of Easter, there will be Junior Rugby clinics, appearances by rugby legends, this year's players for autographs and interaction with fans, kids activities, cultural performances and an egglette and milk tea festival. The legendary Long Lunch is now in its 23rd year and still remains the ultimate way to kick off the Sevens weekend. Rugby speakers, dancing performances and a new theme (to be revealed soon) will provide the entertainment for the crowd of 600+, (along with a 3-course lunch and free-flowing wine). How Much? 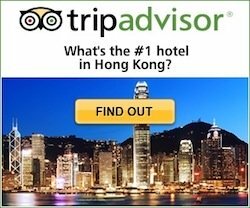 HK 2,300 + per person, HK $ 26,400 + per table. 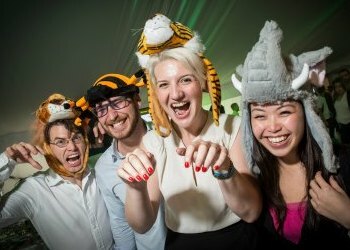 Remember proceeds benefit children's charities in Asia, with more than US$2.9 million raised since the event's inception. Just as good excuse as any, the streets of Lan Kwai Fong is where it will be happening the entire week. After all the Stadium action, this is where it will be happening every night. There will be booth games, beer and street food and even a parade to liven the party. Rugby is much like football, the sport is wildly popular in England and the Commowealth States, including Australia and New Zealand, from which it has spread to the Pacific Islands. In fact, rugby is considered the National sport in New Zealand. Rugby Sevens is a variation of Rugby Union. The teams consist of seven players instead of 15 players that participate in regular matches. The games are quick consisting of two seven-minute halves, so basically one match is done in 15 minutes and entire tournaments can be played over a weekend. Another landmark in the popularity of the sport was Rugby Sevens' debut at the 2016 Summer Olympics in Rio de Janeiro. There are two main tournaments in Rugby Sevens: The World Cup and the World Series. The World Cup is held every 4 years, the next will take place in 2022, the host nation is yet to be determined. 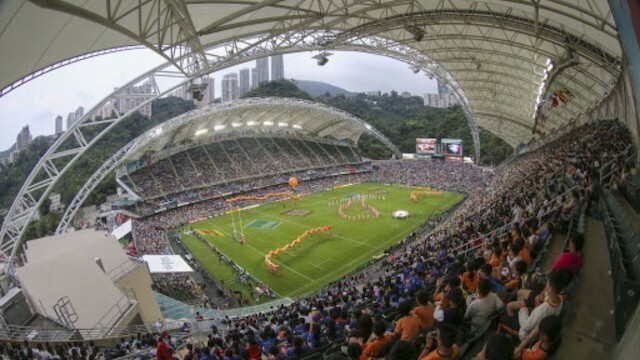 In the annual Sevens World Series, national teams compete in a circuit of 10 rounds, one of which is played in Hong Kong which is known as the Hong Kong Sevens. So as you can expect, fans from all over the world flock to Hong Kong on the weekend of the tournament, which sells out months in advance. For this year's kick-off times check the official site www.hksevens.com.